Waffle Knit Cardigan Just $18.99! Down From $43! Shipped! 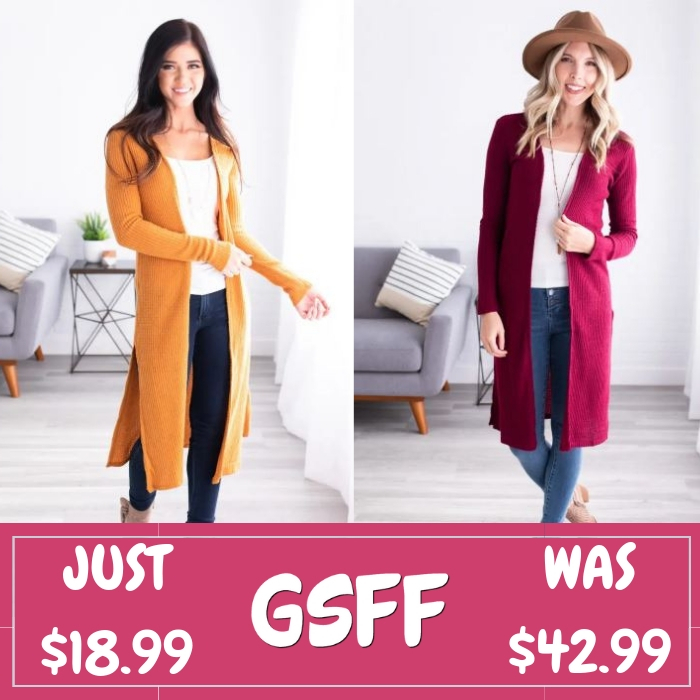 You are here: Home / Great Deals / Waffle Knit Cardigan Just $18.99! Down From $43! Shipped! This deal expires on February 11! Hurry over to Jane where you can score this Shannon Waffle Knit Cardigan for just $18.99 down from $42.99 PLUS FREE shipping! Sophisticated and comfortable, this Shannon Waffle Knit Cardigan is the best of both worlds! With a loose flowy fit, long length, chic understated colors, a waffled texture, and of course, pockets, what’s not to love? This duster is made from super soft fabric and has slits on the sides.